The photo above was taken by Richard Dworkin in May 2005, who has graciously permitted me to use it here. More of Richard's photos of this sign and others at this destruction site can been seen here. Regarding the circumstances of his discovery, Richard writes, "You could just glimpse a bit of one of the signs through the shed they'd built out, so I took a look. The workmen were at first reticent to let me in to take a picture, but I really wanted to. Within days they built 135 out again, covering these up." The founder of Dochtermann Fireproof Storage was Karl Dochtermann (1842-1917) (known as Charles Dochtermann in the U.S.). He is the subject of one of the biographies in Carl Wilhelm Schlegel's American Families of German Ancestry in the United States, originally published 1918-1926. Schlegel writes, "Karl Dochtermann, son of Gottlub Dochtermann, was born at the family home in the village of Schozach, in the district of Heilbronn, on the River Neckar, Kingdom of Würtemberg, Germany, September 4, 1842. He was educated in the village school at Schozach, and was there confirmed in the Lutheran church at the age of fourteen... Soon after having attained to manhood years he decided that he would emigrate to the United States... He accordingly ... embarked on a steamer bound for the harbor of New York City, where he landed in the month of April, 1865. Immediately upon his arrival here, the young German at once sought employment and secured a position in a butcher establishment in New York City. He continued in this line of employment up to the year 1874, at which time, as a result of his industry and frugality, he enabled himself to begin business on his own account, and he finally established himself in the van and express business at 211 Second street, New York City." Karl (Charles) Dochtermann is found in the U. S. Census of 1880 living at 15 Avenue B., Manhattan. With him are his wife, Charlotte, age 30, born Darmstadt, and his first three sons, Charles Jr. 6, Frederick 2, and Paul 1 month. Dochtermann gave his occupation as "driver (express)." The earliest address for Charles Dochtermann, carman, in New York city directories is 1874. However, three earlier listings appear in Trow's New York City Directory 1871 to 1873. During the 1880s and early 1890s Dochtermann seems to have been either manufacturing or importing wood products. In these years his business at 15 Ave. B and later at 207 and 209 Second St. is described as mats, wood, baskets, and willowware. This changed in 1894 to "express" at 209 and 211 Second St. 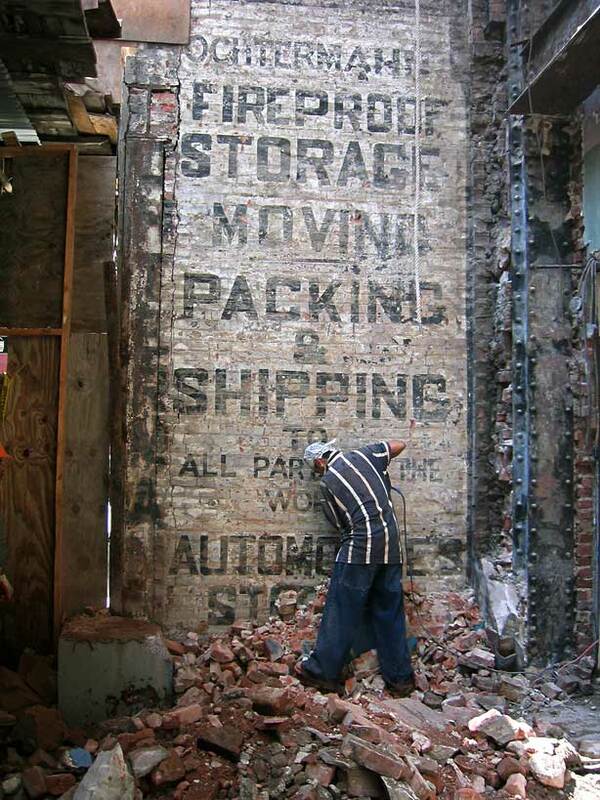 In 1902 Dochtermann Van & Storage expanded into additional space at 465-471 E. 10th St. This ad for Dochtermann appeared in the Manhattan telephone directory Oct. 1910. By this time Dochtermann's sons had entered the business. Primary among the sons were Charles Dochtermann Jr. (1874-1920), Frederick Lawrence Dochtermann (1878-1959), Paul Dochtermann (1880-1975), Louis Henry Dochtermann (1883-1962), Henry William Dochtermann (1887-? ), and Herman Christian Dochtermann (1890-1972). Beginning around 1910, in addition to the express and storage warehouse business the Dochtermanns dealt in real estate under the name Dochtermann Realty Co. There was also a garage called Dry Dock Garage Inc. at 732 E. 11th St.
All of the Dochtermann sons registered for the World War I draft. At the time several of them lived in Mineola on Long Island (Nassau County), while Henry W. Dochtermann lived in Passaic, New Jersey, Herman C. Dochtermann lived in the Bronx, and Charles Dochtermann Jr. lived on St. Mark's Place, Manhattan. In 1917 Karl (Charles) Dochtermann Sr. died in a tragic fire while asleep in his home at Rocky Point, Suffolk County, Long Island. The Dochtermann Storage Warehouse at 135 W. 14th St. opened in 1934. They stayed in business here until 1963. From around 1936, in addition to the warehouse and express business there was also a Dochtermann Sales Corp., Pianos located here. Herman C. Dochtermann gave this as the name of his place of employment when he registered for the World War II draft in 1942. At that time he still lived in the Bronx. Immediately above the Dochtermann sign in Richard Dworkin's photo of 2005, was another sign, this one reading Silberstein's Fishing Tackle (Click for image). Silberstein's was D. Silberstein Sons, Pawnbrokers, who were not located at 135 W. 14th St., but next door at 137 W. 14th from 1927 to 1945. The D in D. Silberstein Sons was David Silberstein (1837-1908), and the sons were Isaac J. Silberstein (1864-1955), Solomon D. Silberstein (1872-1960), and Abraham Silberstein (1878-1962). David Silberstein was an immigrant from Prussia who established himself as a pawnbroker at what was at the time the foot of Sixth Avenue (around Carmine/Bleecker Sts.) around 1870. The family was recorded in the 1880 U. S. Census living at 10 Sixth Avenue. With David Silberstein, age 40, were his wife, Rosa, age 35, and their children: Isaac 14, Bella 11, Julia 9, Solomon 7, Abraham 3, and Mary 2. David Silberstein was in business here until his death in 1908. In June 1908 this notice appeared in the New York Times. Around 1898 the Silberstein sons opened a second pawn shop at 2457 8th Ave. (in Harlem, near 132nd St.) called Silberstein Bros. These locations remained the same until 1927 when the Sixth Ave. shop was moved to 137 W. 14th St. Both shops closed in 1945/46.